Recently, a local drive thru has implemented the phrase “It was my pleasure to take your order today” and “It was my pleasure to serve you today”. Both very nice thoughts but let’s face it, a drive thru at 7am is about speed and accuracy and in as much as the pleasurable salutations are nice, they are often delivered to fast and with no genuine feeling behind them. It feels like an airport actually….a busy one. Yes, the daily grind often finds all of us trying to get to the next meeting, putting out this fire or that and as demand picks up so does everything that goes along with it. It’s important to make sure that you are genuine with your words and actions and make sure to let people you work with and people you work for know that they are a valued and essential. Be genuine in your gratitude. 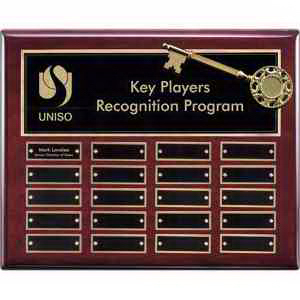 There comes times too where an employee or customer deserves special recognition. Maybe it’s a work mile stone or maybe it’s a loyalty reward. Maybe they hauled in a big sale or maybe they found an innovative use for a product that somehow slipped past the R&D. We can help with a huge selection of items customized just for you. Take a look at our page dedicated to recognition and appreciation. We can custom tailor just about anything to help you say thank you and show your genuine feelings. Click on the plaque below to see the page and all of the items.